What has threatened to be a triple dip recession has got business owners everywhere tightening their budgets. And it seems that when cutting costs, everyone turns to fire safety. In fact, the opposite is true. The economy makes it even more important to prevent a fire. They are, after all, one of the most costly, and wasteful things that could ever happen to a business. Ironically, there is a historical link between the recession and certain types of crime. During recessions, malicious arson attacks increase. Yet worryingly, it’s not just business owners who feel that less should be spent on fire safety. The fire service is continually being undermined by sector cut-backs. In April 2013, West Midlands Fire Service announced that 34 firefighter’s jobs were to be axed. This came after the recent Smurfit Kappa paper mill fire that blazed for days and brought 100 firefighters onsite. In 2004, The Chief Fire Officers’ Association (CFOA) estimated that 60% of private businesses never recover from a fire. The loss of data, working hours and replacement materials are simply too much for many businesses to content with, especially at a time when the economy is rocky to say the least. 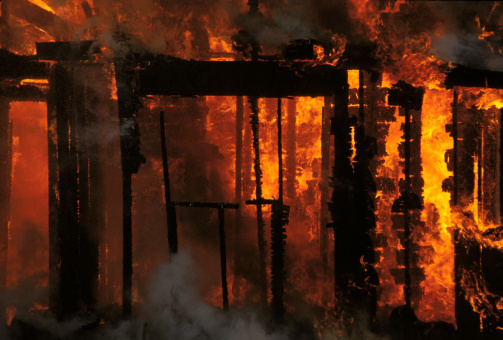 In 2008, UK insurers were paying out £3.6m every day to pay for fire damage. It’s hardly surprising that in the same year, it was estimated that fires cost the UK economy £8.3 billion! Following a fire, buildings are checked to see if the building has complied with the relevant guidelines. If they fail this check, business may not be eligible for insurance payments any longer. Of course, each fire also has a knock on effect on the economy of the individual and local community. A severe fire at Daw Mill coal mine in Birmingham is still blazing today, though it began in February 2013. It is predicted that the fire will continue to burn for several more months, and when it is safe enough to inspect the fire, the introduction of ventilation to the area could provoke re-ignition. This incident at Daw Mill has forced the company to put 400 miners out of work. The effect of those redundancies to the local economy and the workers’ household incomes is phenomenal. Despite the overwhelming evidence that suggest fire safety is more important than ever during a recession, the government have still made cut backs, setting the example for businesses. In March 2013, DM Care Limited was ordered to pay a total of £40,375 after being prosecuted for the non-compliance of fire safety regulations. This was actually the second time they were prosecuted in a 12 month period. Surely it makes more sense for those in business and the government to invest in fire safety.